Lewis attended Stubbington Hse School ref letter Dr E L Fenn to E V Fenn 5 Feb 1897. Lieut Hopkins was killed at 10am on the morning of the 26th Sept 1915 at the Chalk Pits near Loos, he was shot through the heart and died instantly. He was by my side when shot and had done splendid work, he was always so cheerful and plucky. His death was a great loss to my Battalion. L C Howard Lt Col.
Letter in possession of Adrian Hopkins 2003. In writing to tell you of my sincere sympathies with you in the loss you have sustained. I am able to give you some few details of Lewis's death. His and my platoon had been in the front line of the attack, which we made about midnight Saturday 25th & after driving the enemy back we had to be quiet and wait for dawn. On Sunday, about 7 o'clock the counter-attack came, and for about an hour and a half to 2 hours. We stuck to our place behind a little ridge. We then got orders to move off to the left and it was while we were moving that Lewis was shot, at 8:50 AM. I went down to prop his head up, but he passed away instantly without any pain, shot through the heart. It was when I was laying him down again that I was shot myself and had my elbow joint broken, but as they were taking me away, I brought his hat, so if you would wish to have it or the badge out of it, I shall be so happy to send it to you. I must apologise for this letter, but I am sure you will be glad to know that he didn't suffer. With renewed sympathies and sorrow for you in your loss "Hop" was such a favourite with his men as well as the Officers. 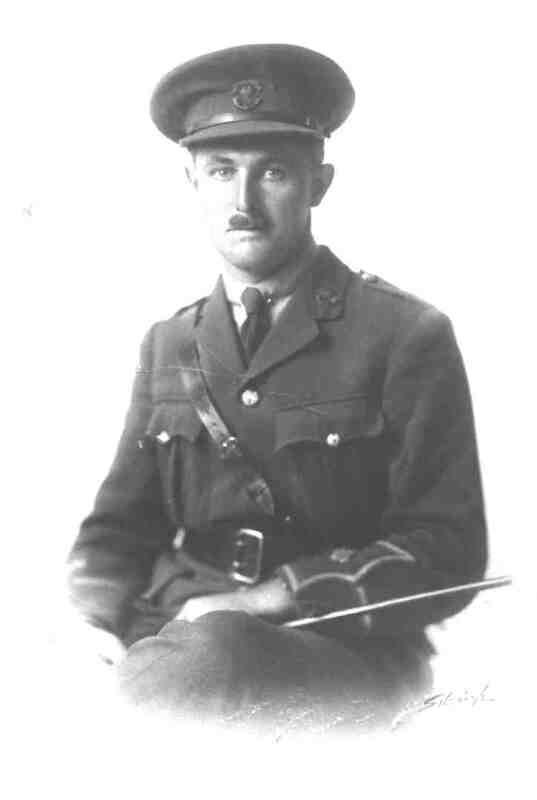 I cannot tell you how deeply I regret the death of Lieutenant Lewis Hopkins who was killed in action last Sunday 26th of September 1915 near Loos. He fought quite close to me all Saturday night and Sunday morning and his cheeriness - his bravery and example to the men were superb, I am proud to have had such a man with me. He was shot through the heart at 11:15 AM Sunday morning and died instantaneously. His loss to this Regiment is greater than I can tell you of - and to me personally - his loss must be almost as great as to you. To say he died bravely and splendidly seem so insufficient. If there is anything and all I can do for you or for him please command me. I can never find words to let you know how much we shall miss him. Believe me - as one who shares your grief equally with you. The Battle of Loos was the largest British offensive mounted on the Western Front in 1915 during World War I . The first British use of poison gas occurred and the battle was the first mass engagement of New Army units. The British offensive was part of the attempt by the French to break through the German defences in Artois and Champagne and restore a war of movement. Despite improved methods, more ammunition and better equipment the Franco-British attacks were contained by the German armies, except for local losses of ground. Casualties in the Herbstschlacht (Autumn Battle) were high on both sides.